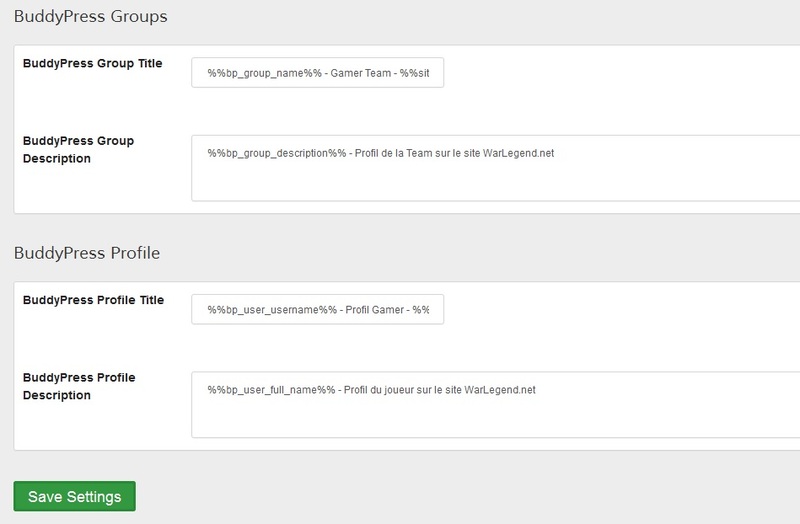 I added Infinite SEO last week so that I could get my buddypress content indexed (member profiles, groups...). Did you leave the BuddyPress Title & Meta settings as default or did you modify them in any way? If so, could you post a screenshot of those settings please? It would help to see how you have set things up. The title and description are correctly modified as can be seen by viewing the page info in the browser (screenshot). site:warlegend.net "war legend communaute public"
You can see that the specific group description does appear in the results when that group is searched for. However, the title links to the main groups page. So things are being indexed, but perhaps not in the way you may have expected. Thanks Patrick, from what I understand it means it's indexed but only the url /groups or /members ? and the meta will have all informations ? It seems a bit strange, is this intended? hmm I was expecting every members or every groups to be searchable and shown independently with its corresponding url, is that possible? Thanks for your great help ! Unfortunately, this member is no longer active. For any others who may happen upon this thread, please know that the sitemap does indeed index all BuddyPress profiles and Groups as long as the settings allow it. Hi PatricK. I am having a similar issue. My site map does indeed contain all the buddy-press group pages, and the settings I have for Infinite SEO are those you've described above. But Infinite SEO is generating a "rel=canonical" tag in the child group pages, redirecting google back to the parent page - essentially telling google that there is "nothing new here". Unfortunately on my site there is lots of new information on the individual pages and I need google to index them. Other than commenting out "rel_canonical()" in function wds_canonical() (which I admit is rather crude) is there something I can do? Commenting out that line would likely impact other areas too. Thanks Patrick. I've commented out the line for now simply because I'm getting pressure from my client to do so but if you can come up with a better solution please let me know. It will for sure impact other areas - those pages that really should have a rel='canonical' added to them will not, and who knows what that will do to the overall SEO. So on the one hand your plugin is saying "take a look at this page" and then on the other hand it is saying "don't bother, its the same as the parent page". Google said "ok" and didn't bother so my pages weren't indexed. Does this make sense to you? Am I making the issue clear? There are no canonical links at all there. So commenting out code in the plugin did effectively remove them. Yes. I was hoping there would be a less intrusive way to accomplish it though. For now I guess that will have to do. The only problem I can foresee is when your site gets very active with lots of members and groups. If the sub-pages of all the groups and profiles are all indexed, your sitemap is going to get horrendously long very quickly. I'm wondering if that will have an impact on your site's performance in the search engines. Yes, I understand the risks and have pointed them out to the client. I know google will allow up to 50,000 links in a sitemap and you're right - that limit can be reached fairly quickly. I believe at that point google will just ignore the site map and index the regular ol' way, following links from page to page. I'm not sure, though, if there are any penalties that will come into play when this happens. I'm going to mark this thread resolved for now. If you do notice any strange goings on in the search engines when the sitemap starts clogging up, please don't hesitate to update this thread.